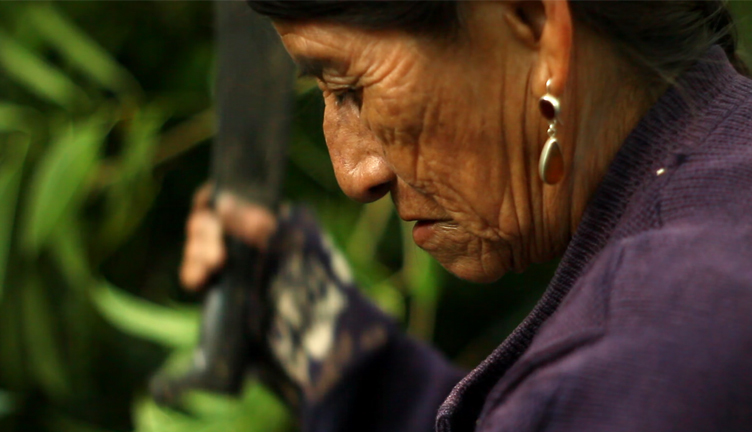 Filmmaker Charles Fairbanks collaborates with Mexican Zoque artist and activist Saul Kak in the documentary film "The Modern Jungle" (La selva negra), a provocative twist on the traditional ethnographic feature, creating a portrait of both Zoque culture and the tensions that arise as a result of globalization. The film, which received its world premiere at Visions du Réel in Switzerland, and was part of the official selection at the Guanajuato and Morelia International Film Festivals, will have its U.S. Premiere as part of the official documentary competition at the 23rd edition of the Slamdance Film Festival, taking place January 20–26, 2017, in Park City, Utah. Carmen lives modestly, but in peace, on the plot that her husband paid for with his life, fighting for a landless farmers’ movement. Juan, although a shaman, suffers from a hernia that his incantations cannot treat, and falls under the spell of a pyramid-scheme-marketed nutritional supplement. This is ‘the modern jungle’ that appears before our unbelieving eyes. Filmmakers Fairbanks and Kak, who, by paying their protagonists because they are “working” for their film and by hiding nothing of this partly venal relationship, successfully dismiss, with a single filmic gesture, the myth—dear to a certain Western-centered ethnology—of the “pure” native, now placed under the permanent influence of Western acculturation. The initial desire for the project, five years in the making, was to depict Zoque culture in an honest yet dignified light. On the surface the film is a compelling portrait of the tensions between the indigenous world and its encounters with Westernization. Yet the study of Zoque culture also becomes a playful study on the art of cinema and the documentary form itself. In scenes that harken to Jean Rouch’s seminal films such as Jaguar and Chronicle of a Summer, Juan and Carmen watch and comment on the very film in which they appear. "The Modern Jungle" is set in the region of la selva negra (“The Black Jungle”), in southern Mexico, which is named after the thick fog that is common there. As such, darkness and light, fog and obscurity, become outsized forces in the film. A portrait of globalization, "The Modern Jungle" documents the struggles and encounters of the local characters with outside forces: from capitalism and commodity fetish, to the culture of cinema and the directors of this film.